Each phase of an MR project includes key decisions, processes, and expected outputs from these processes. Using the guidance in this chapter, a PDT member may enter a project at any phase and be able to understand and contribute to the completion of the project. The MR phases described in this document follow the Comprehensive Environmental Response, Compensation, and Liability Act (CERCLA) process. Preliminary Assessment/Site Inspection (PA/SI) – PA/SI includes gathering and reviewing historical information, visiting the site to evaluate the potential for munitions hazards, and determining whether further response actions are required. Remedial Investigation/Feasibility Study (RI/FS) – Additional data are gathered during the RI/FS to determine the nature (munition type and physical characteristics) and extent (horizontal and vertical) of munitions and MD. These data also support risk assessment, development of remedial action objectives (RAOs) as needed, and evaluation of potential remedial alternatives. 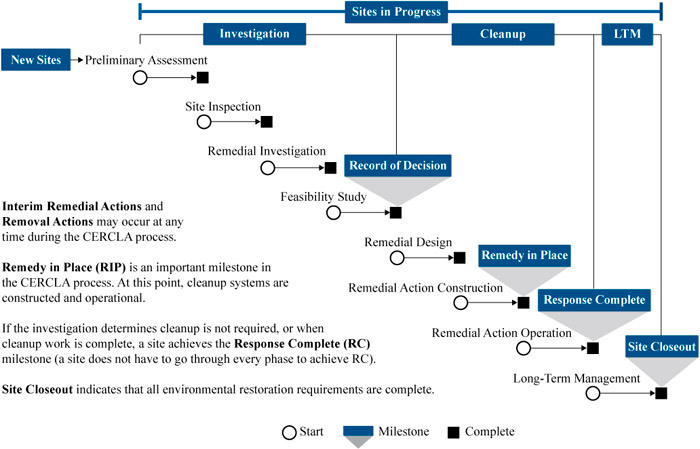 Proposed Plan – This document details the proposed approach to remediating the site and provides the public with information necessary to participate in remedy selection. This document is the basis for public comment on a preferred remedy before a Record of Decision is established. The Proposed Plan is not discussed in this chapter because it does not involve gathering data. Record of Decision – This document provides the public with a consolidated summary of information about the site and the chosen remedy, including a description of the technical parameters of the remedy, specifying the methods selected to protect human health and the environment (including treatment), land use controls, and cleanup levels. The Record of Decision is not discussed in this chapter because it does not involve gathering data. The Record of Decision is a type of Decision Document, which describe the reasoning for the choices made or changes to a Proposed Plan. Remedial Design/Remedial Action (RD/RA) – RD/RA includes the detailed design and implementation of the selected remedy. The design may include multiple components such as a physical remedy, institutional controls, or engineering controls. The term “physical remedy” is used in this document to describe an RA where removal of UXO/DMM is the basis of the alternative selected (in whole or as part) in a decision document. Additional details regarding the MR phases are presented in this chapter. Figure 5‑1 illustrates the consecutive phases and decision points associated with gathering data. Figure 5‑1. Munitions response life cycle. additional data collection is required. Information gathered during this phase is used to develop the preliminary CSM. The extent of the information collected in the PA/SI may vary by project, and this section presents processes and outputs to support preliminary CSM development. Are the location and initial boundaries of MRS correct? Does an explosive hazard exist? Is there an immediate explosive hazard, which would trigger a Time Critical Removal Action (TCRA) or Non-Time Critical Removal Action (NTCRA)? High confidence is required for deciding the location of the MRS and for determining the potential for explosive hazard at the MRS. Records and reports or other historical information identifying MRS location and munitions type should consist of primary or secondary sources supported by field observations. However, lack of empirical evidence from the SI site visit is not sufficient information to override an MRS determination but should indicate uncertainty in location and munitions type or potential risk. The key PA/SI output is the preliminary CSM. The CSM represents relevant known and hypothetical site characteristics, conditions, and features developed from lines of evidence. A CSM can be presented in multiple ways, including text description, tables, figures, flow diagrams, maps, and pictures. Preliminary versions of the CSM are based on limited information or assumptions and may contain significant uncertainty. CSM uncertainties should be clearly identified so that these uncertainties can be reduced to acceptable levels. To transition the MR CSM from an early phase to more detailed model, the PDT evaluates the decisions that must be made, the quality of the data used to make decisions, data uncertainties, the impact data uncertainties have on the decisions, data gaps, and what additional data are necessary to address uncertainty and fill data gaps. The preliminary CSM is the basis of investigation design and used to develop the DQOs (MR-QAPP Worksheet #11) and other quality parameters (Figure 3‑2) that enable decisions. These decisions are documented during the DUA (MR-QAPP Worksheet #37). The CSM is documented on MR-QAPP Worksheet #10. Was the explosive hazard identified in the SI confirmed? What are the type of munitions? What is the density and spatial distribution (horizontal and vertical extent) of the munitions? What is the current and anticipated future land use? Who uses the land (receptors) and what are their activities (pathways)? Munitions Type: Munitions hazards vary with the likely response of the explosive (energetic filling) to stimuli in the surrounding environment. Therefore, a munitions hazard assessment (type, size, condition, energetic filling, sensitivity, and munitions density) is critical to assessing and defining risk. To make a correct decision regarding risk, the initial munition hazard assessment must be informed by higher levels of evidence, such as facts, empirical evidence, or statistical evidence. The hazard assessment should be supported by conclusions from geophysical data, visual observations, and historical evidence. Spatial Distribution of Munitions: Information detailing the spatial (horizontal and vertical) distribution, estimated density of anomalies, and current and anticipated future land use is necessary to estimate the potential for exposure to munitions hazards. This information is also needed to design an effective remedial response that will meet the remedial objective. The estimated density of munitions is used to support cost estimates for potential remedies and generally should not be used as the sole basis for conclusions as to whether the MRS is contaminated. Historically, geophysical surveys have focused on the horizontal distributions of anomaly density to determine the most likely location of munitions. While this information is critical to establishing locations to recover UXO/DMM on a horizontal scale, recovery of these items depends on instrumentation’s capability to “see” (detect) the items at depth relative to land use intrusive depths. The land use considerations and exposure scenarios that drive risk of encounter often center on the presence of explosive hazard with depth. Therefore, much of the confidence and uncertainty is centered on the lack of defined vertical distribution and detection capabilities for geophysical instrumentation. The vertical distribution of contamination is important in an MR project because of the detection depth limitations of the technologies used to detect UXO/DMM. With appropriate QC, commercial systems currently available can provide reliable data to the depth of their detection capability. Some factors that influence depth of detection are power of the detection system, background noise, and size of the buried metallic item. For analog methods, additional factors influence detection, such as operator attentiveness to detail, operator ability to properly scan completely, and operator expertise in interpreting instrument signals. Advances in geophysical technologies and improved quality processes to support confidence in depth data have significantly improved geophysical data acquisition. A hypothetical example vertical depth profile is presented in Figure 5‑2. This example presents the vertical depth profile developed from RI results (left) and the evolution to the vertical profile created based upon the detailed information documented in the RA (right). Figure 5‑2 includes the depth of blind seeds, recorded depth of recovered UXO, the maximum detection depths of the sensor for the UXO type, and the maximum depth of anticipated land use for comparison. These data are necessary to support risk management decisions for MR projects. This example presents a land-use depth above the maximum detection depth of the sensor for the UXO type, but sometimes the land-use depth is below the maximum detection depth and the PDT must define the approach to account for this difference. Figure 5‑2. Vertical depth profile example. Other information: Historical records may provide details beyond the types of munitions that were used. The records may include information about the military operations, including when, where, how often, and how much munitions were used, which may assist the PDT in developing and focusing the investigations. Other information used to develop the CSM includes topography and terrain, vegetation, geology, and the presence of environmental resources and effects such as threatened and endangered species, wetlands, coastal zones, and cultural and archeological resources. This information informs the PDT as to how technology can support the study or be limited by site conditions. These characteristics are also critical to developing use scenarios for the site. Are there known or suspected (not ruled out) munitions used at the MRS? What are the munitions types? What types of UXO/DMM and hazardous subcomponents are present? What is the sensitivity of the UXO/DMM and hazardous subcomponents? Has there been any exposure to “abnormal environments” such as open burning, jolt tests, or seismic activity (natural or imposed)? What was the severity of any incidents? What is the extent (horizontal and vertical) of the munitions at the MRS? What is the nature of surface/subsurface UXO/DMM and MD? What is the estimated concentration of munitions at the MRS (such as estimated munitions per acre)? What is the depth of UXO/DMM and MD that would indicate the most likely location of an explosive hazard? Is there a high anomaly density area within the MRS? Does the high anomaly density represent a target area or other munitions-related area such as an open-burn/open detonation area or disposal pit? What are the receptors and pathway of exposure to the hazard? What are the accessibility conditions of the site? What is the current and anticipated future land use for the site? How often is the site used? Are there natural barriers that prevent access? Are there existing restrictions on use? What are the activities at the site which may impart energy on the MRS? What is the depth of current and anticipated future land use for the MRS? Do munitions at the MRS present a risk that requires a response action? If yes, establish RAOs to address risk. As part of an RA, physical removal of explosive hazard may be selected to reduce or eliminate risk at a munitions response site. Other types of remedies do not include physical removal and may be used to reduce risk of encountering the hazard. Examples include engineering or institutional controls to prevent access or change in land use, or education and awareness to change behavior. For this reason, the term “physical remedy” is used in this document to describe an RA where removal of UXO/DMM is the basis of the alternative selected (in whole or as part) in a decision document. Physical remedy is not to be confused with a “removal action” that requires further remedial response activities to complete the response process and produce the decision document. A removal action can be implemented at any point in the process to mitigate an imminent threat to human health or the environment. The physical remedy may be the whole or a part of an RA that meets the objective of reducing risk to an acceptable end state. During a physical remedy to remove an explosive hazard, information is collected to confirm key characterization decisions and determine whether RAOs have been met. Information collected includes geophysical data and intrusive operation results (identification of items removed in support of a physical remedy). The successful completion of RAOs is based upon decision points established during initial planning. That success is documented during the DUA (MR-QAPP Worksheet #37), when final verification and validation of data is evaluated. This step includes confirmation that MPCs have been met and all previous assumptions of the CSM are correct and unchanged. Were anomaly selection criteria appropriate? Were all QC seeds detected, identified correctly or appropriately addressed through root cause analysis? Were all dug items characterized correctly? Were all targets of interest (TOI) correctly recovered or explained? Where might UXO/DMM still exist, if anywhere? Were key elements of the CSM confirmed? The following examples of DQOs apply to several phases, including the PA/SI, RI/FS, and the RA. In the first step of the DQO process, the planning team members and leader should be identified. The team must then formulate a concise description of the problem and develop a CSM of the environmental hazard to be investigated. Finally, the team determines the required resources including budget, personnel, and schedule. The examples below include bracketed information that varies by specific site. Example Problem Description – Characterization: The current CSM strongly suggests the presence of a target area within the MRS boundary that could present a risk condition in some or all portions of the MRS. There are many metallic sources buried within this area and it is not known if any might be UXO/DMM. The problem to be resolved is to determine which, if any, portions of the MRS present a complete exposure pathway to UXO or DMM. Example Problem Description – Characterization: Evidence from previous investigations at the MRS [such as preliminary assessment (PA) and the site inspection (SI)], suggest that explosive hazards may be present resulting from former use [date range] as a [describe the type of facility and its uses]. [Briefly state the evidence, for example, confirmed presence of UXO/DMM, or evidence that UXO/DMM exists due to confirmed presence of high explosive fragmentation]. Depending on the types and distribution of UXO/DMM present [list known or anticipated munitions on the MRS], there may be a potential risk of explosive hazards to [describe current and reasonably anticipated future human receptors]. Further study is needed to (1) characterize the types and locations of potential UXO/DMM hazards; (2) differentiate any high anomaly density areas from low anomaly density areas and determine if the high anomaly density areas are munitions related; and (3) given the reasonably anticipated future receptors and pathways for the MRS, determine whether there is an explosive risk present. Example Problem Description – Physical Remedy: The ROD identifies potential explosive hazards are present at the MRS due to its former use as a [describe the type of facility and its uses], and there is a risk that an incident will occur. The RAO has been defined to reduce the risk due to the presence of [name specific munitions] within [horizontal boundary] and [depth] to address exposure to [receptors] via [pathway] such that a negligible risk determination can be supported for current and reasonable anticipated future land use. As documented in the decision document (or Record of Decision) a physical remedy was selected [or state “as part of the selected alternative,” if the physical remedy is paired with other activities in the selected alternative] to remove UXO/DMM at the MRS and meet the RAO. In step two, the team identifies key questions that the study is designed to resolve, along with alternative outcomes or actions that may result based on the answers to these key questions. For complex problems, the PDT may identify multiple decisions to be made. The PDT organizes these decisions in a sequential or logical fashion within Step 2 and examine them to ensure consistency with the problem statement from Step 1. Example Goal – Characterization: Determine the nature and extent (horizontal and vertical) of UXO/DMM contamination and determine areas where exposure to potential explosive hazards exist. Example Goal – Physical Remedy: Determine if the physical remedy has met the requirement of the RAO to reduce the potential exposure to an acceptable end state. Step three requires the team to (1) identify types and sources of information needed to resolve decisions or produce estimates; and (2) support choices to be made in later steps of the DQO process. The team should then be able to select appropriate sampling and analysis methods for generating the information. In this step, the PDT determines the data needed to meet objectives of the current phase, which forms the basis of later DQO development. Data should be sufficient to support future decisions. Documentation should include the intended data uses and data needs such as the location/depth of UXO/DMM, how the UXO/DMM could be caused to function, what harm each specific UXO/DMM component can cause, degree of statistical confidence levels for UXO/DMM densities, and sensitivities for the geophysical survey. Example Inputs – The primary inputs include the types, locations, and depths of UXO/DMM identified at the site, how the UXO/DMM could be caused to function, current and anticipated future land-use of the site and depths of related activities, physical characteristics of the site. and detection capabilities of the instrumentation specific to the munitions identified (vertical CSM). In this step, the PDT also defines any spatial or temporal limitations to the study, for instance, periods of nesting of threatened species that must be avoided, or technology limitations of instrumentation. Example Boundaries – Characterization: The goal of Step 4 is to define the spatial (horizonal, vertical, temporal) limits of the study area to determine the concentration and distribution of anomalies within that area. The horizontal boundary is defined based on information such as historical use, information gathered from previous investigations, and anticipated future land use and may be further refined during the characterization based upon the results of the geophysical data collection. Example Horizontal Boundary: – The horizontal boundary of the study is the MRS boundary, which was established based on historical documentation of the former safety range fans and targets. The MRS boundary represents the area where, by definition, there are known or suspected munitions. This study will further define the target areas within the MRS boundary by delineating areas potentially used via the identification of surface munitions or munitions debris. The vertical boundary is defined based on information such as the detection capabilities of the geophysical data collection instruments, anticipated future land use, and historical use including known munition types. The maximum reliable depth of detection is based upon the munition being at the least optimal position and orientation under the sensor. Munitions with more optimal positions and orientations are detected at greater depths. The specific vertical boundary is based on the anomaly threshold as defined in Step 5 but could be affected by physical site constraints such as shallow groundwater. This depth range could change as further information is gathered during the characterization. Example Vertical Boundary – The vertical boundary of the study is the surface of the MRS to approximately 60 cm in depth. This boundary is based on the deepest documented depth of the largest munition type found at the MRS (60 mm mortar), the detection capabilities of the geophysical sensor (MetalMapper 2×2) used to detect this item, and the shallow anticipated future land use (agriculture). This study further defines this vertical boundary based on the results of the geophysical data collection and munition types that may be identified intrusive investigation. Example Boundaries – Physical Remedy: The horizontal and vertical distribution profile resulting from the characterization phase will be used to bracket the physical remedy [list the land use depths and anticipated detection capabilities to support adequate recovery]. Describes the parameter or measurement (mV/A and signal to noise ratio [SNR] measurement) necessary to make inferences about the DU. Specifies the type of inference or inferential method (for example, direct or probabilistic). States action level (mV/A and SNR that defines anomaly detection). Develops the logic (decision rules) for drawing conclusions from evidence. The PDT constructs “If…then…else…” decision rules by combining the selected parameter, the action level, the scale of decision making described in Step 4, and the alternative actions (Step 2). Example If-Then – Characterization: If a measured response amplitude of ≥_# mV/A is present in the detection data, and the signal to noise ratio is ≥/#, then the anomaly is identified as a potentially explosive munition. Example If-Then – Characterization: If an unacceptable probability of an encounter with a potentially explosive munition is determined to be present, then a feasibility study will be conducted. Example If-Then – Physical Remedy: If the QA/QC criteria and completeness parameters support high confidence in the recovery of UXO/DMM within the MR site, then the data support achievement of the RAO. After completing Steps 1 through 5, the PDT derives project-specific MPC that new or existing data must achieve to satisfy DQOs. MPCs are expressed as DQI and MQOs. MQOs establish requirements (tolerable error) for individual DQIs. Failure to achieve MPCs may affect the usability of the data. Usability of the data is evaluated in the DUA Report. Example Performance Criteria – Intrusive Investigation Accuracy/ Completeness Classification survey correctly classifies 100% of the validation seed items. Performance and acceptance criteria are discussed further in Chapter 7. Developing a detailed plan for obtaining needed data is the last step in the process. All information and outputs generated in Steps 1 through 6 are compiled. This information is used to identify alternative sampling and analysis designs that are appropriate. This step includes development of a protocol designed to minimize sources of error and achieve desired confidence in the final decision. The PDT selects and documents a design yielding data that achieve the performance or acceptance criteria. Example Plan for Obtaining Data – The DQO process produces a full set of specifications that support the qualitative and quantitative design of a data collection effort. If well designed, these specifications result in data that meet minimum quality requirements for decision-making. These specifications comprise the MPC (DQI and MQOs) for the sample collection design. The sample design is broken down into a series of specific processes and data collection activities, (DFWs). Decision trees are recommended to evaluate the conformance of specific tasks to established objectives. General MR processes and tasks are developed further in Chapter 7.